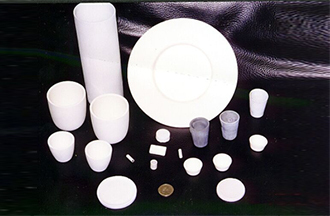 Accumet Materials Co. manufactures a range of composite ceramics, including tubes used in high-temperature and corrosive environments. Our composite ceramics exhibit excellent thermal shock resistance and are inert to most molten metals. The high density prevents wetting and metal penetration. Typical applications include use with submerged heaters, riser tubs for molten aluminum alloys, and use in all types of furnaces. 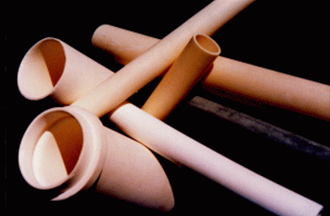 Our composite ceramic tubes are built for use in high temperature and corrosive environments. They're made by slip casting, allowing us to produce tubes in complex sizes and shapes up to 36" in length. Each one can be made to close tolerances per your unique specifications. Accumet Materials offers a wide range of standard and custom labware for use in extremely corrosive laboratory environments up to 2600 degrees Celsius. These high density ceramics are gas tight and extremely resistant to high temperatures in both oxidizing and reducing atmospheres. A broad range of ceramic materials are available in standard circular dishes, combustion boats, rectangular trays, lids, crucibles, and rods. Accumet Materials' 99.4% MgO ceramic material offers superior chemical resistance and attacks by metals and slags, making it a suitable replacement for alumina. The material has temperature resistance up to 2200 degrees Celsius and offers good mechanical strength. It is also compatible with nickel based super-alloys, and high temperature superconductor materials. Applications include molten metal alloy processing, piezoelectric materials processing, and high temperature superconductor materials. Accumet offers a complete standard line of MgO flat bottom crucibles, round trays, flanged lids, rectangular trays, and tubes. 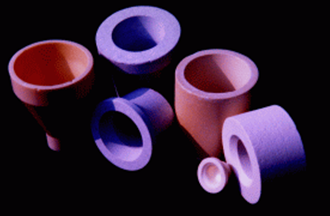 In addition to our standard line, Accumet can supply custom quality crucibles, tubes, and pressed shapes per customer specifications for specialized refractory and corrosive applications. For a prompt quote, call, fax, e-mail, or write your requests and include dimensions, tolerances, and a description of the application. Our engineers will recommend the material best suited for your application. Metal coated hollow ceramic spheres enable design engineers to manufacture high strength light weight parts. Thermal conductivity can be varied and thermal expansion can also be controlled. The Aluminum and Nickel coatings are 99+% pure, and have a consistent thickness. Complete coverage and adhesion is guaranteed and the coatings are stable in air at room temperature. These coated microspheres can be pressed or forged into lightweight structures or substrates. Parts formed using our microspheres are durable and machinable. For best results, the powders should be added to other matrix materials such as magnesium, aluminum, nickel, titanium, iron, or another material in volumes of 10-40%, depending on the properties desired. Typical coatings are aluminum at 10-15% of weight or nickel at 20% of weight, with other coatings available by request.